Watermelon refers to both the edible fruit and vine-like plant (Citrullus lanatus of the family Cucurbitaceae) of a climbing and trailing herb originally from southern Africa and one of the most common types of melon. This flowering plant produces a special type of fruit known by botanists as a pepo, a type of egigynous berry or false berry (accessory fruit) that is derived from an inferior ovary and is characteristic of the Cucurbitaceae, a family that also includes cucumbers, squashes (such as pumpkins), luffas, and muskmelons (such as cantaloupe). In species of Cucurbitaceae, other parts of the flower (including the basal parts of the sepals, petals, and stamens) can ripen along with the ovary, forming the false berry. The watermelon has a thick rind (exocarp) and fleshy center composed of mesocarp and endocarp. 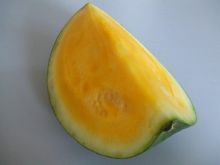 The watermelon fruit, loosely considered a type of melon (although not in the genus Cucumis), has a smooth exterior green and yellow rind and a juicy, sweet, usually red or yellow, but sometimes orange, interior flesh. The plants produce male and female flowers separately on the same plant, and the female flowers have inferior ovaries. The flesh consists of highly developed placental tissue within the fruit. All parts of the watermelon fruit are used by people, including the fleshy interior, the seeds, and the rind. The flesh may be eaten fresh or used to flavor drinks, and is an excellent source of vitamins C and A, as well as a good source of vitamin B6 and vitamin B1 and various minerals. The seeds are eaten as a snack or added to other dishes, and may be roasted and seasoned. They are a good source of fat and protein. The rind is edible and may be stir-fried, stewed, pickled or even grilled. Beyond these values, the watermelon plant provides aesthetic delight and the fruit an appeal to the senses of taste, sight, and touch. Ecologically, the watermelon flowers provide a source of nectar and pollen for bees. American humorist Mark Twain, in one of his novels, had a character colorfully refer to the watermelon as "chief of this world's luxuries, king by the grace of God over all the fruits of the earth. When one has tasted it, he knows what the angels eat. It was not a Southern watermelon that Eve took; we know it because she repented." David Livingstone, an explorer of Africa, described watermelon as abundant in the Kalahari Desert in southern Africa, where it is believed to have originated. There, the ancestral melon grows wild and is known as the Tsamma melon (Citrullus lanatus var citroides). It is recognizable by its pinnatifid leaves and prolific fruit, up to 100 melons on a single vine. For this reason it is a popular source of water in the diet of the indigenous people. The flesh is similar to the rind of a watermelon and is often known as citron melon (distinct from the actual citron, of the citrus family). It is used for making pickles, and because of its high content of pectin is popular as a constituent of jams, jellies, and other gelled preserves. It has established itself in the wild in Baja California. It is not known when the plant was first cultivated, but Zohary and Hopf (2000) note evidence of its cultivation in the Nile Valley from at least as early as the second millennium B.C.E. Finds of the characteristically large seed are reported in Twelfth dynasty sites; numerous watermelon seeds were recovered from the tomb of Pharaoh Tutankhamun (Zohary and Hopf 2000). By the tenth century C.E., watermelons were being cultivated in China, which is today the world's single largest watermelon producer. By the thirteenth century, Moorish invaders had introduced the fruit to Europe; and, according to John Mariani's The Dictionary of American Food and Drink, "watermelon" made its first appearance in an English dictionary in 1615. Museums Online South Africa list watermelons as having been introduced to North American Indians in the 1500s. Early French explorers found Native Americans cultivating the fruit in the Mississippi Valley. Many sources list the watermelon as being introduced in Massachusetts as early as 1629 (Orzolek et al. 2010). Southern food historian John Egerton has said he believes African slaves helped introduce the watermelon to the United States (Motes et al. n.d.). Parsons (2002) lists African slaves and European colonists as having distributed watermelons to many areas of the world. Parsons also mentions the crop being farmed by Native Americans in Florida by 1664 and the Colorado River area by 1799. Other early watermelon sightings include the Midwestern states (1673), Connecticut (1747), and the Illiana region (1822) (Parsons 2002). Until the 1940s, however, it was hard to find watermelons in good condition at grocery stores. Melon lovers had to grow their own (which tended not to keep for long), purchase them from local grocers supplied by truck farmers, or purchase them from roadside produce stands. Now they can be found in most any local grocery store and, if preferred, in slices or whole, with seeds or without. Charles Fredric Andrus, a horticulturist at the USDA Vegetable Breeding Laboratory in Charleston, South Carolina, set out to produce a disease-resistant and wilt-resistant watermelon. The result was "that gray melon from Charleston." Its oblong shape and hard rind made it easy to stack and ship. Its adaptability meant it could be grown over a wide geographical area. It produced high yields and was resistant to the most serious watermelon diseases: anthracnose and fusarium wilt. Today, farmers in approximately 44 states in the U.S. grow watermelon commercially, and almost all these varieties have some Charleston Gray in their lineage. Georgia, Florida, Texas, California, and Arizona are the United States' largest watermelon producers (CBHS 2006). This now-common watermelon is large enough that groceries often sell half or quarter melons. There are also some smaller, spherical varieties of watermelon, both red- and yellow-fleshed, sometimes called "icebox melons." Orangeglo: This variety has a very sweet orange pulp, and is a large oblong fruit weighing 9-14kg (20-30 pounds). It has a light green rind with jagged dark green stripes. It takes about 90-100 days from planting to harvest (SSE 2007a). Moon and Stars: This variety has been around since 1926. The rind is purple/black and has many small yellow circles (stars) and one or maybe two large yellow circles (moon). The flesh is pink or red and has brown seeds. The foliage is also spotted. The time from planting to harvest is about 100 days (Evans 2005). Cream of Saskatchewan: This variety consists of small round fruits, around 25cm (10 inches) in diameter. It has a quite thin, light green with dark green striped rind, with sweet white flesh and black seeds. It can grow well in cool climates. It was originally brought to Saskatchewan, Canada by Russian immigrants. These melons take 80-85 days from planting to harvest (SSE 2007b). Melitopolski: This variety has small round fruits roughly 28-30cm (11-12 inches) in diameter. It is an early ripening variety that originated from the Volga River region of Russia, an area known for cultivation of watermelons. The Melitopolski watermelons are seen piled high by vendors in Moscow in summer. This variety takes around 95 days from planting to harvest (ITFN 2016). For commercial plantings, one beehive per acre (4,000 m² per hive) is the minimum recommendation by the US Department of Agriculture for pollination of conventional, seeded varieties. Because seedless hybrids have sterile pollen, pollinizer rows of varieties with viable pollen must also be planted. Since the supply of viable pollen is reduced and pollination is much more critical in producing the seedless variety, the recommended number of hives per acre, or pollinator density, increases to three hives per acre (1,300 m² per hive). Although so-called "seedless" watermelons have far fewer seeds than the seeded varieties, they generally contain at least a few soft, pale, edible seeds. They are the product of crossing a female tetraploid plant (itself the product of genetic manipulation, using colchicine) with diploid pollen. The resulting triploid plant is sterile, but will produce the seedless fruit if pollenized by a diploid plant. For this reason, commercially available seedless watermelon seeds actually contain two varieties of seeds; that of the triploid seedless plant itself (recognizable because the seed is larger), and the diploid plant, which is needed to pollenize the triploid. Unless both plant types are grown in the same vicinity, no seedless fruit will result. This system for growing seedless watermelons was first developed by H. Kihara in Japan and subsequently improved by O J Eigsti in partnership with Kihara. This scientific relationship was begun at the Third International Genetics Congress, held in Stockholm, Sweden in 1948. Their collaboration lasted for over 20 years until Kihara died in 1986. Eigsti, a professor at Goshen College in Goshen, Indiana, developed a tetraploid hybrid in the 1950s, which became the gold standard for all seedless watermelons developed since then. In 1986, Eigsti's company was reorganized and a joint venture, American Sunmelon, was entered into with SunWorld International and in the ensuing eleven years, seedless watermelon became a staple in supermarkets around the world. In 1998, Eigsti's tetraploid hybrid along with all of the assets of American Sunmelon were sold to Syngenta, the seed producing arm of Novartis A.G. 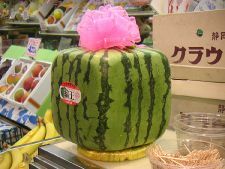 In Japan, farmers of the Zentsuji region found a way to grow cubic watermelons, by growing the fruits in glass boxes and letting them naturally assume the shape of the receptacle (BBC News 2001). The square shape supposedly makes the melons easier to stack and store, but the square watermelons are often more than double the price of normal ones. Pyramid-shaped watermelons have also been developed. All parts of a watermelon fruit—fleshy interior, seeds, and rind—can be used. Herbst (2015) notes that Asians love the seeds roasted and that in many parts of the world the pickled rind is a favorite. A one-cup serving of watermelon will provide around 48 calories. Watermelon is an excellent source of vitamin C and vitamin A. Watermelon also provides significant amounts of vitamin B6 and vitamin B1, as well as the minerals potassium and magnesium. Pink watermelon is also a source of the potent carotenoid antioxidant, lycopene. Watermelon is 92 percent water by weight, the highest percentage of any fruit. Fresh watermelon may be eaten in a variety of ways and is also often used to flavor summer drinks and smoothies. 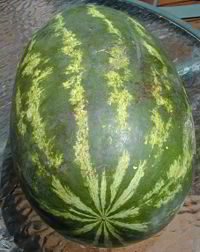 In the United States and South Africa, one may also find an alcoholic novelty known as a hard watermelon, or a watermelon that has been enhanced with an alcoholic beverage. This process involves boring a hole into the watermelon, then pouring the liquor inside and allowing it to mix with the flesh of the fruit. The watermelon is then cut and served as normal. Watermelon seeds are rich in fat and protein, and are widely eaten as a snack, added to other dishes, or used as an oilseed. Specialized varieties of watermelon are grown that have little watery flesh but concentrate their energy into seed production. In China, watermelon seeds are one of the most common snack foods, popular especially with women, competing with sunflower seeds, and sold roasted and seasoned. In West Africa, they are pressed for oil, and are popular in egusi soup and other dishes. There can be some confusion between seed-specialized watermelon varieties and the colocynth, a closely-related species with which they share many characteristics, uses, and similar or identical names. 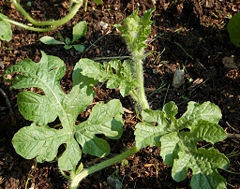 Watermelon rinds are also edible, and sometimes used as a vegetable. In China, they are stir-fried, stewed, or more often pickled. When stir-fried, the de-skinned and de-fruited rind is cooked with olive oil, garlic, chili peppers, scallions, sugar and rum, providing a way to utilize the whole watermelon. Pickled watermelon rind is also widespread in Russia, Ukraine, and Romania. Grilled watermelon, known as watermelon steak due to its visual similarity to raw steak, has started to become a popular item in restaurants. The watermelon also has been used as a popular symbol. The watermelon slice is striking and unmistakable in appearance. It looks like a kuku flower in bloom. Art related to the Mexican holiday Dia de los Muertos (Day of the Dead — October 31–November 2) commonly depicts watermelons being eaten by the dead or shown in close conjunction with the dead. This theme appears regularly on ceramics and in other art from the holiday. Watermelons are a frequent subject in Mexican still life art. 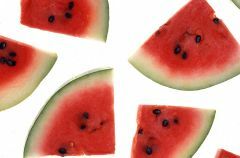 The image of a watermelon slice being eaten and general references to watermelons sometimes historically have been used derogatorily. In the nineteenth and early twentieth centuries, African Americans often were depicted in racist caricatures as being inordinately fond of watermelon. Southerners of any race frequently have been lampooned for the fruit's popularity in the South over the years; however, some of the folk humor about Southerners has been gentle self-parody, as seen in the annual watermelon seed-spitting contests at Southern festivals like Georgia's "Redneck Games." In 2007, the Oklahoma State Senate passed a bill in 2007 declaring watermelon as the official state vegetable, with some controversy about whether it is a vegetable or a fruit (Jackson and Mock 2007). Assuming that character of Pudd'nHead Wilson speaks for the author of the novel of the same name, then Mark Twain was very fond of watermelon indeed. In this novel he wrote, "It is the chief of this world's luxuries, king by the grace of God over all the fruits of the earth. When one has tasted it, he knows what the angels eat. It was not a Southern watermelon that Eve took; we know it because she repented." BBC News. 2001. Square fruit stuns Japanese shoppers. BBC News. Retrieved February 28, 2019. Cucurbit Breeding Horticultural Science (CBHS). 2006. Charles Fredric Andrus: Watermelon breeder. NC State University: Cucurbit Breeding Horticultural Science. Retrieved February 28, 2019. Evans, Lynette. 2005. Moon & Stars watermelon (Citrullus lanatus) SFGate. Retrieved February 28, 2019. George Mateljan Foundation (GMF). 2007. Watermelon. The World's Healthiest Foods. Retrieved February 28, 2019.
International Tropical Fruits Network (ITFN). 2016. Watermelon Common Varieties Seed Savers Exchange. Retrieved February 28, 2019. Jackson, Ron, and Jennifer Mock. 2007. Watermelon is the state vegetable ... seriously NewsOK. Retrieved February 28, 2019. Motes, J. E., J. Damicone, W. Roberts, J. Duthie, and J. Edelson. n.d. Watermelon production. Oklahoma Cooperative Extension Service HLA-6236. Retrieved February 28, 2019. Orzolek, Michael D., William J. Lamont, Lynn F. Kime, Steven M. Bogash, and Jayson K. Harper. 2010. Watermelon Production Agricultural Alternatives, The Pennsylvania State University. Retrieved February 28, 2019. Parsons, J. 2002. Gardening column: Watermelons. Texas Cooperative Extension of the Texas A&M University System. Retrieved February 28, 2019. Seed Savers Exchange (SSE). 2007a. Orangeglo Watermelon. Seed Savers Exchange. Retrieved February 28, 2019. SSE. 2007b. Cream of Saskatchewan Watermelon. Seed Savers Exchange. Retrieved February 28, 2019. Shosteck, R. 1974. Flowers and Plants: An International Lexicon With Biographical Notes. New York: Quadrangle/New York Times Book Co. ISBN 0812904532. Texas A&M University Aggie Horticulture (TAMUAH). 2007. An African native of world popularity. Texas A&M University Aggie Horticulture website. Retrieved February 28, 2019. Wolford, R., and D. Banks. 2007. Watch your garden grow: Watermelon. University of Illinois Extension. Retrieved February 28, 2019.